On this date in 1779, Londoners crowded Tyburn to witness the hanging of James Hackman for a sensational high-society murder. Just twelve days before his date with the hemp, Hackman had walked up to Martha Ray at the Royal Opera and shot her in the head with a single-shot pistol. Then, he turned a second weapon on himself in a vain attempt to commit suicide. The reader is not mistaken to detect here the mania of unrequited passion. Several years before the young Hackman was a handsome lieutenant introduced to Martha Ray’s social circle. She was a successful soprano on the London stage and though unmarried lived with the Earl of Sandwich as his wife in all but the illustrious name. (cc image) from Molly Elliott. 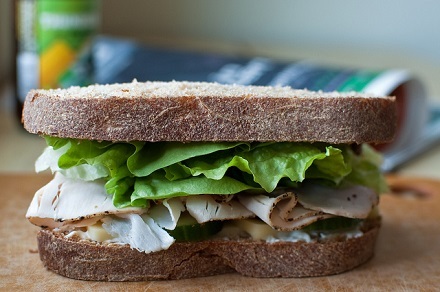 Yes, this is the very Earl of Sandwich who pioneered the eating of things stuck between bread slices. * Sandwich — John Montagu to his parents — had other interests besides the munchies; he was the capable First Lord of the Admiralty throughout the 1770s. (As a result, Captain Cook, whose seafaring explorations were occurring at that time, kept naming islands for the Earl of Sandwich). Despite their age difference and never-formalized status they had a comfortable arrangement; Ray bore Sandwich five children** and the two appeared in public as a couple. The Earl sponsored Martha Ray’s opera career and education. 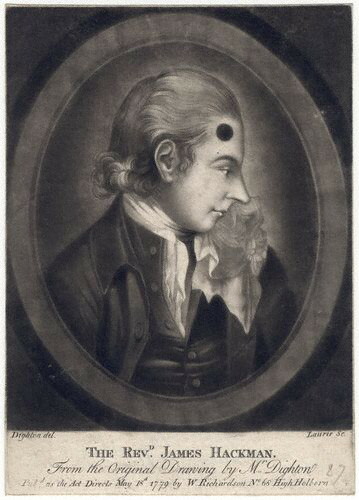 James Hackman met the Earl’s mistress around 1775 and the two formed an intimacy. Just how intimate they might have been has never been firmly established but is clear that as time passed the infatuation increasingly ran in only one direction. Hackman sold his commission in the 68th Regiment of Foot to become a Church of England deacon, perhaps angling by this expedient to woo Martha Ray away from Sandwich to a wholly respectable union. She understandably demurred on this “opportunity” — leading the greenhorn Reverend to his blackguard act. James Boswell was fascinated by the crime; he attended the trial and spilled many public and private words on its subject. While Human Justice is to be satisfied, let us consider that his Crime was neither premeditated‡ Cruelty, nor base Greediness. He is therefore an Object neither of Abhorrence nor of Contempt … Let us unite our fervent Prayers to the Throne of Heaven, that this our Brother may obtain Forgiveness through Jesus Christ, and be admitted in another State of Being to everlasting Happiness. This unfortunate gentleman received the sacrament in the morning with all the fervency and devotion of a sincere repenting criminal: — he repeated that affecting acknowledgment of his guilt, which on his trial drew tears from the audience, and seemed in a state of composure, unruffled with the idea of punishment, which, he said, was no more than he deserved. At nine o’clock he came into the press-yard, where a great crowd of persons assembled to gratify their curiosity. That all might have an equal share of the sight, a lane was formed by the multitude on each side, through which Mr. Hackman passed, dressed in black, leaning on the arm of his friend the Rev. Mr. Porter, whose hand he squeezed as he muttered the solemn invocation to Heaven, not to forsake a sinner of so enormous a degree, in the trying hour of death. 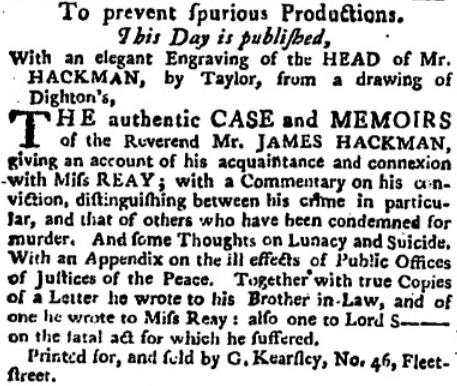 Mr. Hackman was conveyed from Newgate in a mourning coach, attended by the Rev. Mr. Porter Mr. Villette, the ordinary of Newgate, and Mr. Leapingwell, a Sheriff’s officer. He reached Tyburn about a quarter before eleven o’clock. When he arrived at the fatal tree, a cart lined with black was under the gallows ready to receive him. Mr. Porter and Mr. Villette ascended it by a pair of steps, and he followed them unsupported. As soon as he had got into it he walked forward, and fell on his knees, (a position seldom used by persons in his circumstances at Tyburn, as they always pray standing) and the Clergymen did the like, one on each side of him, where they remained praying for about fifteen minutes, then got up, when the rope was put about his neck, and tied to the gallows. In this manner he remained praying between the two Divines for ten minutes more, when the Rev. Mr. Porter embraced him, and Mr. Villette took his leave, and both left the cart. The convict[‘]s cap being pulled over his face, he told the executioner to leave him to himself for a few minutes, and he would drop his handkerchief as a signal when he was ready, which he did after a few minutes pause, and was thereupon launched into eternity. His whole behaviour was manly, but not bold: his mind seemed to be quite calm, from a firm belief in the mercies of his Saviour. He was no ways convulsed, nor was their [sic] any motion of the body that tended to shew it experienced any pain. Nothing more was to be seen than what proceeded from the jerk on quitting the cart. The mob was more numerous than on any other occasion since the death of Dr. Dodd. It was expected Mr. Hackman would suffer at Covent-garden, and preparations were made by some speculating carpenters, who met with a mortifying disappointment. After hanging the usual time, his body was put into a hearse, and taken to Surgeons-hall in the Old Bailey, where it was prepared for the inspection of the public. Mr. Harkman expressed a wish to his friends, that the ceremony of anatomizing his body might be dispensed with; and that his corpse might be treated in the same manner as that of Lord Ferrers. Mr. Hackman intimated to a particular friend, that if his remains could be deposited near those of Miss Ray he should feel inexpressible happiness in the hour of death. A man who was standing near a dray in Oxford-street to see Mr. Hackman pass, was thrown down under one of the horses by the crowd; the horse being frightened, stamped on the man, and beat out his brains. * Allegedly so that the Earl wouldn’t have to leave his beloved gambling table to dine. First speaker: You will either die on the gallows or of some social disease. Second speaker: That depends upon whether I embrace your principles or your mistress. Though it’s been variously attributed, it appears that the retort was originally delivered by the comic Samuel Foote to Lord Sandwich — about Martha Ray. † Notable among the five children of Sandwich and Martha Ray: jurist Basil Montagu. Sandwich’s wife also bore him a legitimate son, who eventually succeeded to the father’s Earldom; the title still exists today. ‡ Hackman had to be talked off simply pleading guilty but in the end he hung his trial hopes on arguing that he intended to kill himself, in Martha’s presence, and was overwhelmed by a momentary “phrensy”. A letter in his pocket meant to be delivered posthumously to his brother-in-law supported this claim; the fact that he brought two guns to meet her rebutted it. Trial judge William Blackstone pointed out to Hackman’s jurors that the composure of the accused before and after the crime did not suggest a madman and that accepting Hackman’s claim of only an instant’s insanity could present a very slippery slope indeed for future murder prosecutions.